A refreshing, blonde beer made with Challenger, Jester, Epic, and Bramling Cross hops. Smooth, hoppy and very fresh. We brewed this as a one off special but it was so popular (and became permanent at the Pub and Kitchen North Shields) that we ended up keeping it as a permanent offer. 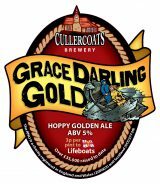 The beer is named after the famous English lighthouse keeper’s daughter, lauded for her part in the rescue of survivors from the shipwrecked Forfarshire in 1838, off the Farne Islands in Northumberland. Read all about her story and the museum celebrating her life on the RNLI website.